NatureWorks' lineup of resins, fibers, and brand owner products highlighted at NPE in March reflected the extension of Ingeo into higher performance segments of the market. Not only that, Ingeo is proving to offer high productivity as well due to the performance characteristics of new grades. Below are examples of what NPE visitors found at the NatureWorks booth. At NPE, three new formulated Ingeo injection molding offerings were highlighted. These formulations are built on NatureWorks' heat-stable technology platform and offer a range of impact and other performance features. Two formulations offer medium and high impact performance with high bio content. This makes them ideal for injection molding applications – particularly those currently in ABS. Additionally, a third Ingeo formulation for profile extrusion applications maintains excellent impact performance, and just as with the injection molding offerings, this formulation's high stiffness offers opportunities for downgauging and materials savings. "Our new Ingeo formulations take things like 'high heat' performance as a given and move beyond that to offer a comprehensive suite of properties, which in some cases exceed ABS," explains Frank Diodato, who leads NatureWorks Durables Business platform. "Furthermore, these new formulations have a renewably sourced carbon content of approximately 90 percent, which is far higher than anything achieved before." 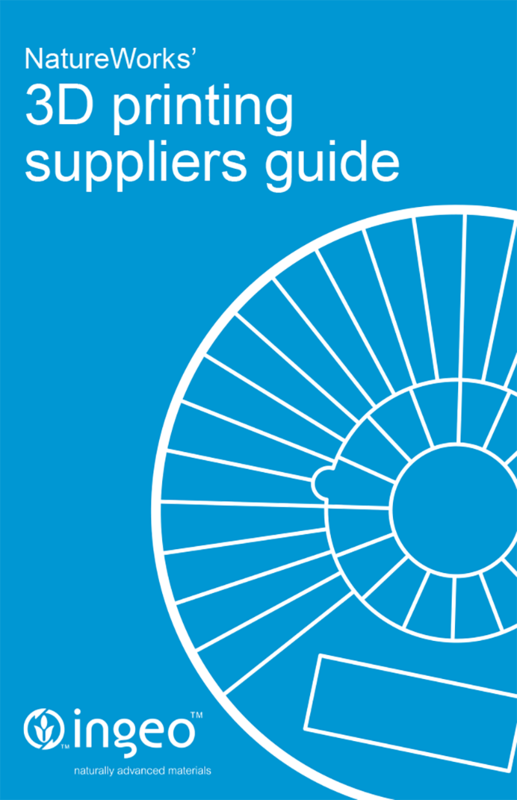 New at NPE was the freshly published 3D Printing Suppliers Guide.The guide identifies the preferred Ingeo 3D filament suppliers around the world. It also provides information on companies offering compounds for 3D printing, as well as authorized regional resin distributors making 3D filament. Also newly released are technical documents that discuss how to process Ingeo into 3D printing monofilament. Read more. The SPI: The Plastics Industry Trade Association and the SPI Bioplastics Division announced at NPE that Eastman Kodak was the winner of the 2015 Innovation in Bioplastics award for its creation of a printing toner which contains more than 90 percent biobased materials. Having Ingeo in such a high percentage of the toner makes it simpler to "deink" paper as it is being recycled. According to Eastman Kodak, their biobased toner will be widely available by May or June. Read more. Also on display were the latest developments based on Ingeo for the blossoming green building industry. Ingeo-based flooring, wall coverings, signage, drain materials and even flooring care pads were exhibited. Rigid thermoform packaging is one of the most successful applications for Ingeo. In the past several years, brand owners like Stonyfield have utilized Ingeo for form-fill-seal yogurt cups. Ingeo performance allows for 15 to 20 percent material reduction in form-fill-seal cups and thermoformed rigid packaging ̶ a significant cost savings, not to mention improved environmental credentials for the brand owner. One of the most exciting recent developments in form-fill-seal cups is transparent Ingeo for showcasing dairy, dessert, and other foods in clear containers. Samples of the new transparent cups along with new high-heat rigid packaging for takeout and reheat at home were featured at the NatureWorks' booth as well as Ingeo foam trays – an alternative to expanded polystyrene foam. New high-heat compostable food serviceware such as hot cup lids and cutlery were featured as well as an extensive line of compostable plates, bowls, cups, trays, and clamshells. Check out the updated Ingeo Food Serviceware Supplier Guide, which contains a wealth of information on global supplier expertise, services, and the product categories they specialize in. New grades of Ingeo nonwovens and fibers are being used for filtration media, personal care and hygiene products, medical fabrics, civil engineering fabrics (erosion control, reservoir lining protection, etc. ), and geotextile and agricultural fabrics. The reasons for adoption include superior dimensional stability, excellent hydrophilic properties, reduced shrinkage, and improved stiffness at higher processing temperatures. 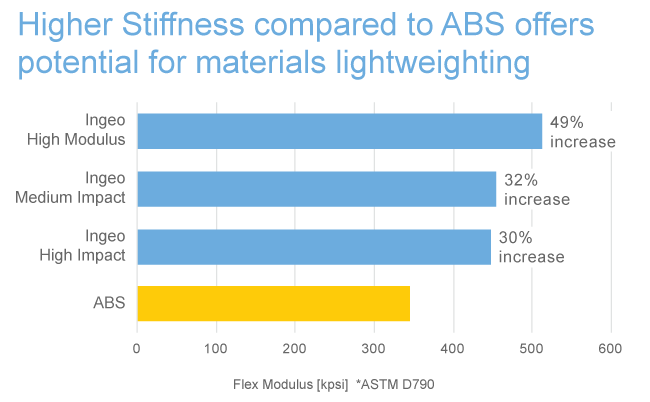 Interest in performance flexible materials continues to rise in the packaging industry. NatureWorks showcased a number of performance solutions including films for packaging and lamination, as well as shrink film solutions labels, bundling and tamper bands. Also displayed were Ingeo-based credit cards, signage and clear folded cartons. The fifth iteration of Innovation Takes Root (ITR) will be held March 30 – April 1, 2016 in Orlando. The Second Decade theme contrasts and compares where Ingeo and NatureWorks were a decade ago when commercial scale production commenced and what the next decade may hold for Ingeo as it continues to gain performance and productivity enhancements along with cost advantages. Save the date, and watch for future program updates on innovationtakesroot.com. The Country Fresh Company now offers transparent snap apart four portion multipacks of individually portioned fruit or vegetable snacks, including apples, grapes, baby carrots, and celery. Apples with caramel dip and baby carrots with ranch dressing are also available. Transparent packaging showcases the inviting fresh fruit and vegetables inside. Ingeo's transparency and snap-ability made it the material of choice for this application. ECOGEL, from Imballaggi Alimentari, is a new type of insulated packaging for ice cream takeaway. Recycled cellulose pulp, a plant fiber, provides superior insulation, while Ingeo creates a moisture barrier between the ice cream and the outer insulated walls of the ice cream container. In areas where there are commercial composters available to pick up organic household waste, the ECOGEL container goes back to nature as soil enrichment for landscaping and gardens. The Treleoni Company designs and manufactures cleaning and polishing pads for industrial floor cleaning machines and hand wipes for industrial cleaning services. The newest addition to the company's product offering is the Provito line of polishing pads made from Ingeo nonwoven fibers. The Ingeo pads are used to enhance the gloss of softer floor finishes. Provito recently earned the USDA's BioPreferred status, which means it will be given preference in many different Federal Government purchasing decisions. Provito attracts cleaning services wanting performance and low carbon footprint. Read more. Fitesa recently won the prestigious Research, Innovation & Science for Engineered Fabrics Conference (RISE) Durable Product Award. Engineers from Fitesa, NatureWorks, and Braskem worked together to produce the new 100 percent biobased spunbond performance nonwoven. This new fiber is composed of not one, but two biobased polymers in a sheath-core, bi-component configuration. The sheath is made of Braskem's I'm green(TM) 100 percent biobased polyethylene, while the core uses Ingeo. The resultant nonwoven is extremely soft, thanks to the bio-PE outer sheath, yet remains strong and robust due to the Ingeo core. Uses include diapers, personal hygiene products, and fabrics used in a host of medical applications. Flavio DiMarcotullio, Business Development Manager, will present NatureWorks: New Packaging Developments with Ingeo. Erwin Vink will present Changing landscape in Europe offering new opportunities for bioplastics. Robert Green, Global Director Fibers and Nonwovens, will moderate the Raw Materials for Nonwovens panel discussion. 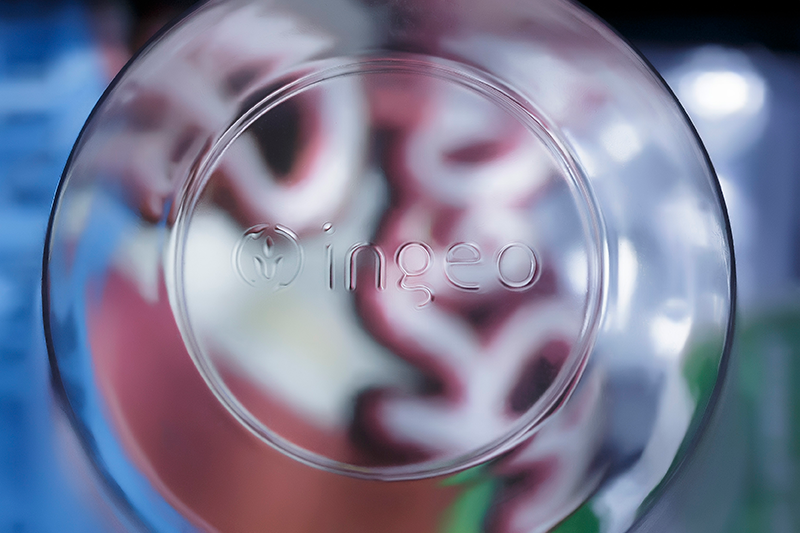 Looking to buy Ingeo biopolymer? Looking for products made with Ingeo? Get updates on product launches, industry news, & events.